Kaçkar Mountains (Armenian: Խաչքարի լեռներ; Turkish: Kaçkar Dağları) or simply Kaçkars (Turkish: Kaçkarlar) are a mountain range that rises above the Black Sea coast in eastern Turkey. Libler Gölü seen from Kırmızı Gedik. The name Kaçkar (from Armenian khachkar (Խաչքար) literally meaning "cross stone") may be used in various senses. It may describe the whole mountain range, including the many mountain groups, or it may just describe the Kaçkar-Kavron group with its highest peak, or just the highest peak itself. 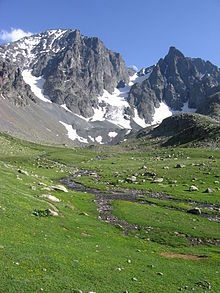 The local name of the highest peak or its mountain group Kaçkar Dağı translates to Kaçkar Mountain, and the name of the range Kaçkar Dağları translates to Kaçkar Mountains. On the south and east, the Kaçkar Mountains are bordered by the Çoruh river valley; on the north, by the Black Sea coast. Kackar Mountains are one of the best trekking sites in Turkey. Kackars have two ideal trekking routes. The first is from the Black Sea side; the path is clear and it is easy to trek, while the Coruh side is more difficult and hazardous. Kackar Mountains are cold and have glaciers, hence ice axes and crampons are required. The best time for trekking is between June and September. ^ "Mt. Kackar to be monitored". Turkish Daily News. (National ed.). Ankara: ProQuest LLC. 31 October 2007. p. 1. Retrieved 11 October 2009. ^ Hadik, Jancsi (1 November 2005). "First Tracks". Skiing. Winter Park, Florida: Bonnier Corporation. 58 (3): 28. ISSN 0037-6264. Retrieved 11 October 2009. ^ Marc Dubin; Enver Lucas (1989). Trekking in Turkey. Lonely Planet. p. 125. ISBN 0-86442-037-4. ^ Robert H. Hewsen. Armenia: A Historical Atlas. — University of Chicago Press, 2001. — 341 p. — ISBN 0-226-33228-4, ISBN 978-0-226-33228-4. P.212. "River between the port of Atina (now Pazar) on the coast and the great inland peak called Kajkar (Arm. Khach'k'ar) Dagh 'Cross-stone Mountain'"
Kackar hiking Trip report of a backpacking trip in the Kackar Mountains. This page was last edited on 8 November 2018, at 02:39 (UTC).